The Pennsylvania Link to Aging and Disability Resources − Berks-Lancaster-Lebanon Service Area partner network − is your "no wrong door" system: a shared statewide approach for Long-Term Services and Supports … for all populations regardless of age, income or ability … including all payers, federal, state, local and private. May 18 – And the Third Saturday of each month | Original Mini-Stand Down, for vets – by vets! June 01 – It’s the third Death Cafe at the Wyomissing Public Library | Will you be there? RSVP now. April 28 – It’s time for the 10th Annual “Empty Bowls” event | It’s not to be missed. April 30 – 20th Annual 50Plus EXPO at Shady Maple | SAVE THE DATE! May 21 – FREE Epilepsy Conference | Register here. Tuesday evenings – Do you want to stop living paycheck to paycheck? Are you interested in new skills and stabiltiy to move forward in life? April 26 | And every fourth Friday at Heisey’s Diner: Coffee and camaraderie. May 03 – It’s time for the May Lebanon Link partners’ network cross-training meeting | You may call / text / email to RSVP now. May 08 – At the 50+ Festival … Learn more about “the gift of conversation” at a FREE Age Wave Initiative presentation. 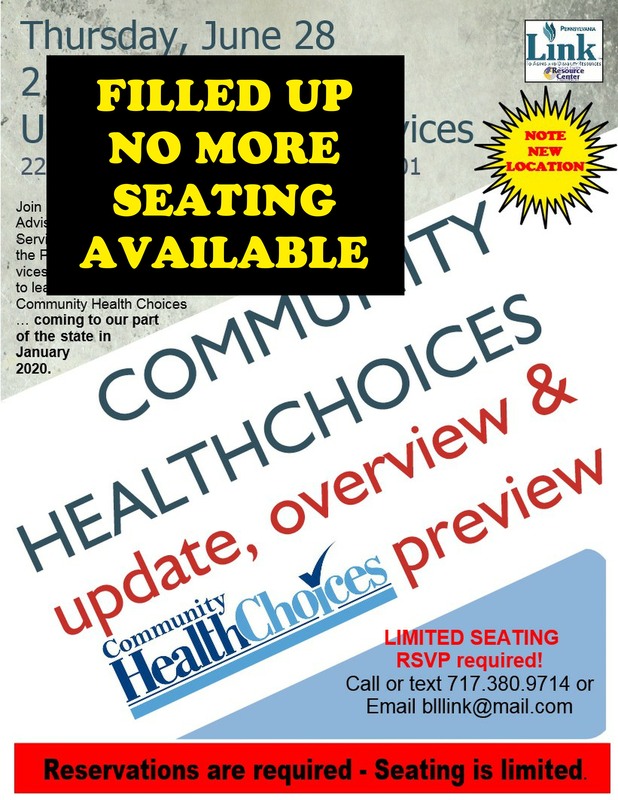 FILLED UP – no more seats available for the June 28 Community Health Choices seminar! PLEASE NOTE all the seating for this Link event is gone. Parking will be at a premium; if you can “RIDE SHARE” with someone, it will be greatly appreciates. Enter your email address to receive an email notifying you of new posts by email.